It would not be unheard of for me to complain, like many others, about Hollywood’s increasingly worrying lack of original content. The machinations of this moneyed industry have truly gone into overdrive with the cashing-in of ‘known’ titles and an excess of bums-on-seats guff. 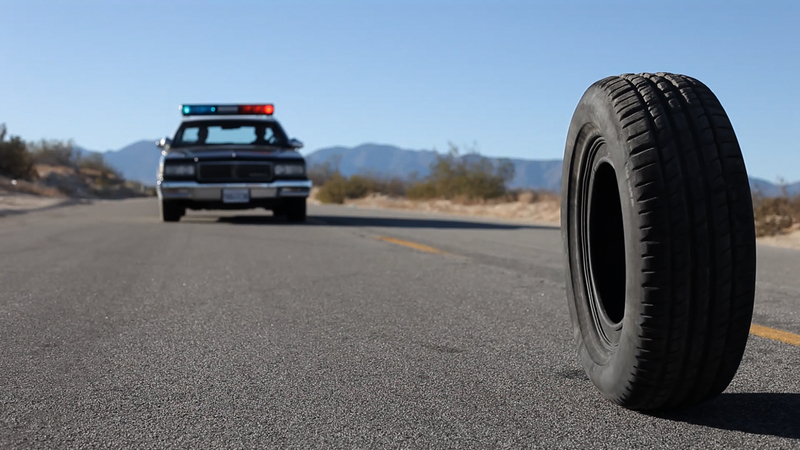 You can imagine, then, how excited I was at the promise of Rubber; Quentin Dupieux’s (he of the better-known musical moniker, Mr. Oizo) avant-garde offering concerning one telepathically murderous tyre. It is well, then, that we might subtitle Dupieux’s seemingly admirable creative flexing exactly as he himself has rather obtusely pitched it from the outset: Quentin Dupieux vs. Hollywood. The tyre’s dusty awakening was such a beautiful and darkly amusing observation of the lone and the inanimate and, had Dupieux ditched the arrogance in favour of continuing with this, he’d have had a much subtler and, consequently, more valid basis for his commendable argument. However, what we instead get is 82-minutes of the most unfounded ego trip I’ve yet seen in the cinematic field. Dupieux’s ‘film within a film’ is his personal pop at the industry and as such is the most horribly contrived, disengaging, near-baseless letdown of a directorial vehicle I’ve yet had the distinct displeasure to view. To have shelved the promise of something so deliciously unique for a cinematic weaving of new clothes for the Emperor is unforgivable and, in fact, given that I ended up feeling I’d rather have watched anything featuring Jennifer Aniston simply for the lack of fraudulence, bizarrely bucks its own purpose. Previous to this, the angriest I’ve felt about a film acclaimed yet under-delivering is Michael Haneke’s Hidden. In light of Rubber, however, this pales given Haneke’s rightly well-respected body of superior work and on-point criticism of the media. Dupieux has yet to prove himself and attain this right, and, unless he drops the ridiculous conceit and critical ham-handedness, I can’t honestly see him doing this. And that is why the result for Dupieux’s painfully self-styled filmic fisticuffs can only be: Hollywood: 1, Quentin Dupieux: 0. You are currently reading “Rubber” (Review) at Eclect Elect.